When driving, you don’t only have to think of the vehicle you are driving, you also have to consider the road and the conditions surrounding that road. There are many things that can go wrong with a road; the structure, the maintenance, the weather in the area, and so on, but some road are built in locations which are dangerous from the outset. Here are some of the most dangerous roads in the world; thrill-seekers, beware. Many have suffered serious injuries or died while driving on these roads. The locals call the North Yungas Road the “Death Road”, a title that should not be taken lightly. Located in Bolivia’s Yungas region, the road bridges together the locales of Corico and La Paz, while taking drivers through an otherwise scenic view of the rainforests of Amazon. A single-lane road with virtually no rails to stop a vehicle from falling into the ravine, the North Yungas Road has claimed hundreds of lives. Known amongst locals—especially those who use this urban road situated near the heart of Quezon City—as the “Killer Highway”, Commonwealth Avenue is perhaps one of those roads that people cannot easily avoid. Commonwealth Avenue leads to high-profile and high-traffic places including the headquarters of a popular Philippine sect, a judicial court, and a prominent state university. This road is the widest in the Philippines, with 18 lanes that claimed the lives of hundreds of local drivers. Built into the highest peaks in the world, it is no wonder why the Himalayan Roads are consistently included in the list of the deadliest roads ever. Most of these roads do not have rails, with just the faces of the mountains as safety on one side. Even careful drivers are wary of passing through these roads, as a single miscalculation can lead to death. The Himalayan Roads are definitely not for drivers who are prone of being deathly afraid of heights or the possibility of a fatal landslide. Carved into the face of the mountain by local villagers, this tunnel is quote on the short end at 1.2 km. However, do not let the seemingly manageable length of the road fool you that you can easily drive through it—an innocent mistake can definitely result into a painful death if ever one should fall into the rocks below. Just five meters high and four meters wide, this is definitely a road that does not tolerate mistakes, even really small ones. The Taroko Gorge is a popular tourist destination in Taiwan, with its view of misty mountains. But the road carved into the mountain is another thing—while the natural scenery is quite lovely, the road can kill you if you are not careful. Like the Guoliang Tunnel Road in China, the Taroko Gorge Road is carved right on the face of a steep mountain. The road is not very wide, but there are plenty of vehicles and pedestrians traversing the narrow road, and everyone has to vie for what little space there is. Inclement weather is also a cause of accidents, and intense seismic activity can easily dislodge the rocks, endangering the people who use this road everyday. Also known as the Strada delle 52 Gallerie al Monte Pasubio, the Pasubio Road in Vicenza, Italy is one of the most dangerous roads in Europe. Built during the First World War into the massif of Mount Pasubio, this treacherous road was once the only safe road for Italian soldiers dodging Austrian enemies. While once very useful for warfare, the Pasubio Road of the present has wonderful views that are possibly fatal for motorists. Making a mistake while traversing the slippery (and incredibly narrow roads) will definitely result into falling into the steep ravine. Most parts of this Italian road are closed for vehicle access, but many locals still like gambling with their lives for easy access to destinations at the end of the raod. Another entry in the list for the Philippines, the Halsema Road connects the province of Benguet to the rest of Northern Luzon. Aside from the fact that this road is the highest in the country (in terms of altitude), Halsema is prone to falling rocks and landslides during the rainy season. A huge chunk of the road remains unpaved, and many drivers—even locals—have fallen to their deaths to the ground more than a thousand feet below. Located near Queenstown, the Skippers Canyon Road is an integral part of the country’s history during the gold rush in New Zealand. The construction for the road, which was intended to ferry the gold miners and the machinery used to dig for the precious metal, was expensive, and maintaining the road was also a problem for the local government. The views are magnificent, but the journey on this road can be fatal to drivers unfamiliar with the narrow winding paths. Do not let the whimsical name of this road fool you; the Way to Fairy Meadows in the Gilgit-Baltistan region of Pakistan is definitely one of the deadliest roads in the world. The Fairy Meadows Road is connected to the infamous Karakoram Highway, and is set thousands of meters above sea level. 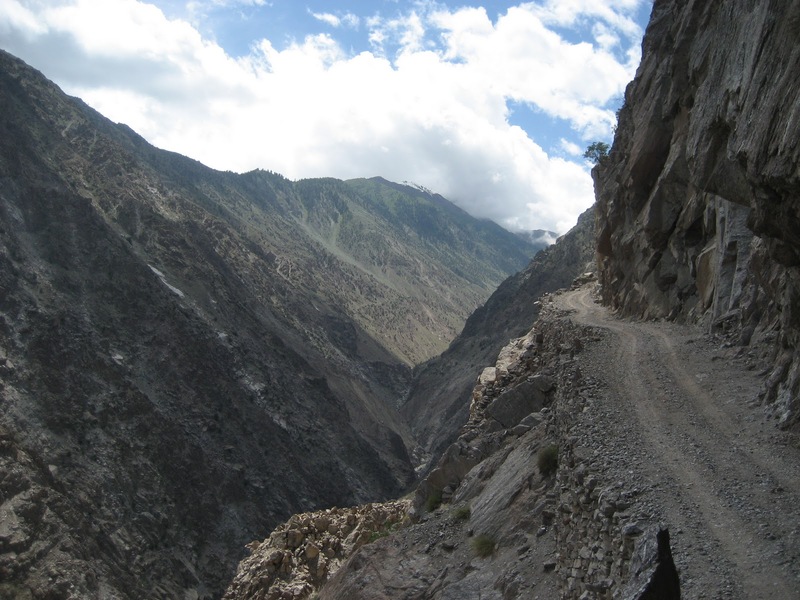 Built by the locals and intended for smaller and lighter vehicles, the Fairy Meadows Road is narrow and incredibly dangerous. Some parts of the road can only be used by pedestrians or bicycles, and a majority of Fairy Meadows Road is closed during the winter because of heavy snowfall. Another treacherous mountain road, the Sichuan-Tibet Highway starts from Chengdu and ends at Lhasa, stretching for over 2,000 kilometers. The road snakes through delightful mountain and forest views, and some drivers (thoroughly prepared for the drive) claim that the potential perils of the road are worth the majestic scenery. Landslides and falling rocks are very common, and the road has already claimed thousands of lives over the last few decades.